It’s here! 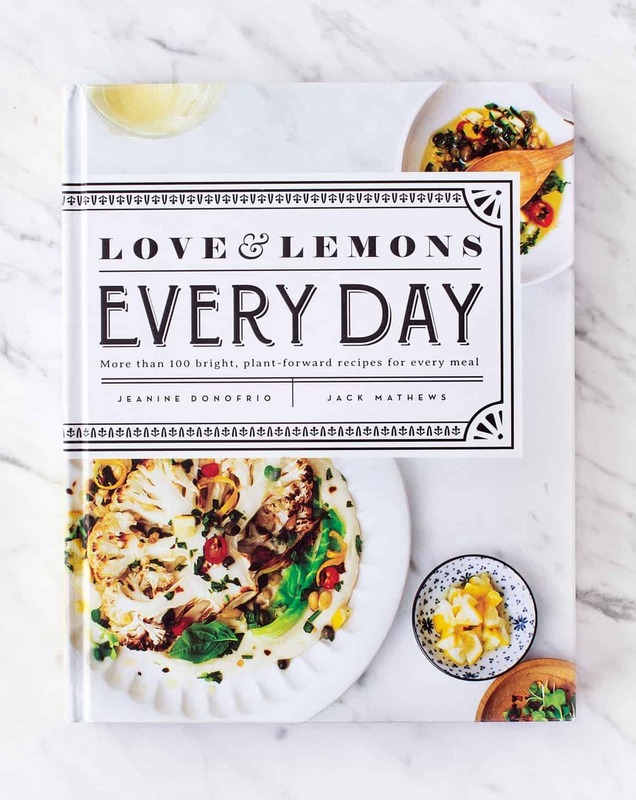 My new cookbook, Love & Lemons Every Day, is out TODAY!! I’m so excited to be sitting here writing this post, because the process of making this book was a long one! About 3 years ago, I set out with SO many ideas that I wanted to pack into this book. Over time, I kept adding more and more… and more. I’d think – “Ooh, this section would be helpful,” or “Oh I’d like to have that information on hand,” and “Let’s add MORE dinner recipes,” etc, etc. As I got carried away, the process got longer, the book got bigger, and now that it’s done, I’m so proud of the final result. It’s a big fat 300-page hardcover book that’s stuffed to the brim with produce-packed recipes for every meal. It’s a feast for the eyes as well as the tummy. The book is full of all-new recipes – from breakfast to dessert – where produce is the star. For example, butternut squash becomes the best creamy queso you’ve ever eaten, broccoli transforms into a zesty green “rice” burrito filling, and sweet potato blends into a smooth chocolate frosting. It’s a resource that you (and I) will want to keep on the countertop, because it’s so darn useful. You’ll find inspiration in the many visual infographics… there’s a giant matrix of five-ingredient salad dressings, a guide to quick weeknight pastas, a grid to show you how to roast any vegetable, and much much more! Here’s what you’ll find in the book! 300+ pages of veggie goodness! More than 100 vegetarian recipes with many many vegan and gluten-free options. Gorgeous photography. 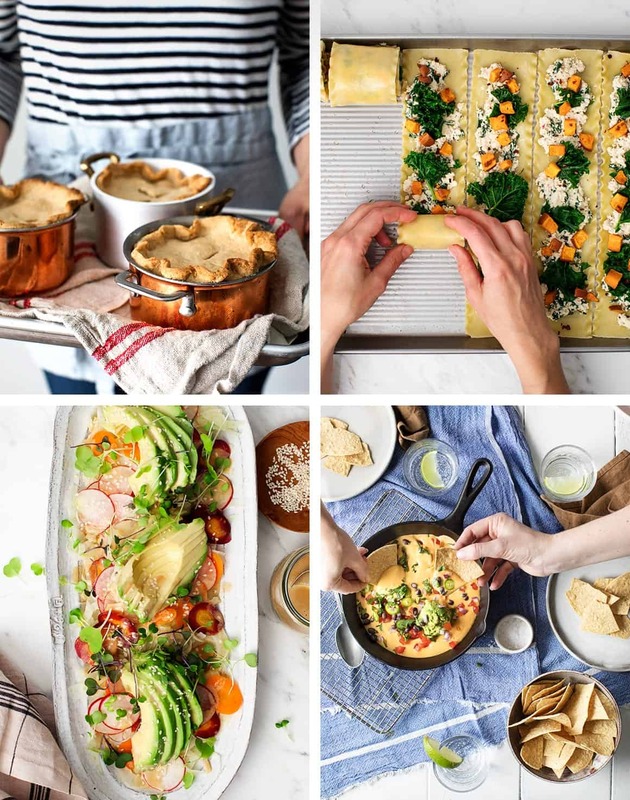 There’s photo for each recipe, and many more for the charts and resource sections – over 300 photos total! All new recipes! This is not a compilation of recipes from the blog – these recipes were created specifically for this book. Recipes for your everyday rotation. I know you already know how to make green smoothies and avocado toast, so you’ll find exciting new recipes for dishes that you’ve never tried before. Tons and tons of helpful visual guides for plant-based staples, quick cooking inspiration, tips for utilizing vegetable scraps, and more! And, of course, there are many more! I am so excited! I pre-ordered so can’t wait to download and look at tonight. I’ve already made the vegan butternut squash mac from the recipe bundle and it is super delicious!! My copy is out for delivery!! I am SO excited to bring some new dinner ideas into my kitchen! Hi Aimee, thank you!! I hope you love the dinner recipes!! Mine is in the mail! Can’t wait to read it and start on the recipes! Keep us posted on any book launch events- would love to celebrate this big accomplishment! Thank you!! I will keep you posted! What city are you in? Chicago! Close by in Lincoln Park. And the book came in the mail yesterday – can’t wait to make everything! I’ll be at Williams Sonoma in Lincoln Park at the end of the month – I’ll keep you posted on the exact date! Great! Would love to come! Another stunning book, friend. Congrats! I love the brightness of the colors in the pictures. Makes me feel and taste the aliveness of spring! Are your vegetarian recipes easily adaptable to turn them vegan? Hi Babette, yep, most of the recipes are vegan and there are vegan options for (most of) the ones that aren’t! Sooooo excited!!! Love the bag, thanks so much!! Thanks Zada, so happy you won a tote! I have your first book and I just received the new book today. I opened it up and started to look at the recipes and cannot wait to try them! I am going now to order a second book for my daughter who will be moving into an apartment at college in the fall (she’s in a dorm now) She will be so excited to make these when she’s in her own place. Love that most recipes are vegan; as are we! Thank you for these incredible flavorful recipes! Hi Cynthia, I hope you and your daughter both love the book!!!! I got my book in the mail today. You guys have outdone yourselves!! I love this book. It is beautifully written and photographed with recipes I can use everyday. I’m so excited to try all of them! I absolutely love your first cookbook and your blog! I am SO excited for your new book. Thank you for helping us make the most delicious plant-forward dinner meals.